'Ken's been the gold standard for corporate leadership and the benchmark that I measure others against,' said Warren Buffett, the lender's biggest investor. In the past two years, Chenault has ramped up promotional spending and offered higher incentive rewards for cardholders to replace income lost with the Costco (COST - Get Report) portfolio; he also jazzed up the signature Platinum Card to compete with the popular new Sapphire Reserve from JPMorgan Chase & Co. (JPM - Get Report) While the moves pushed up expenses, he countered with simultaneous efforts to cut $1 billion in costs. "Given the progress we're making, I thought this was the right time to begin the leadership transition," Chenault told investors on a conference call. "We considered potential candidates from both inside and outside of the company. It has been a very thorough process." The company's shares dipped less than 1% to $91.90 in New York trading on Thursday. American Express previously rose 24% this year, nearly doubling the gains on the broader S&P 500 and boosting the 17% stake of its largest shareholder, Warren Buffett's Berkshire Hatahway Inc. (BRK.A - Get Report) to $14 billion. 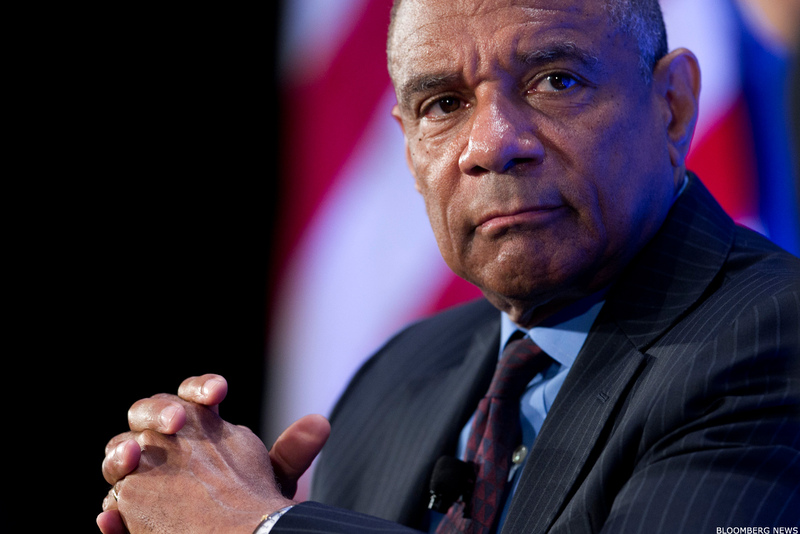 Kenneth Chenault became CEO of American Express in January 2001. "Ken's been the gold standard for corporate leadership and the benchmark that I measure others against," Buffett said in the statement. "He led the company through 9/11, the financial crisis and the challenges of the last couple of years. American Express always came out stronger." The company's solidity was evidenced Wednesday, when it posted 19% growth in quarterly profit. Net income of $1.4 billion, or $1.50 a share, outpaced the $1.48 average of analysts surveyed by FactSet as cardholder spending climbed. Founded in 1850, American Express was one of the first delivery businesses to take advantage of growing shipping demand as the U.S. expanded westward, according to a history posted on its website. The firm introduced the world's first traveler's check in 1891 and offered its first charge card in 1958. ""I've treasured every day of my 37-year career here," said Chenault, who joined the company in 1981, became president of the consumer card group eight years later and took over as CEO in January 2001. "It's been a journey that spanned profound changes in the world of business, the payments industry and the global economy." Since Chenault's successor is the current vice chairman and the two have worked closely together for more than a decade, "we don't expect much turbulence during the transition," Ben Chittenden, an analyst with Oppenheimer, said in a note to clients. The announcement of Chenault's retirement sends two clear messages, he added: that senior management believes American Express's turnaround is mostly complete and that its strategy will be "an offensive version of what it has been doing in the past." Indeed, Squeri himself said the company is well-positioned for growth, despite a fiercely competitive market that's being reshaped by both advances in digital payments and regulatory pressures. "We'll continue pursuing many of our current strategies that show great growth potential, and we'll look for new avenues of growth," he told investors on the call. "I want to build on what Ken has accomplished without forgetting that the status quo, as he often says, doesn't cut it in a fast-changing and competitive environment." Updated from 4:55 p.m. ET on Wednesday, Oct. 18, 2017.